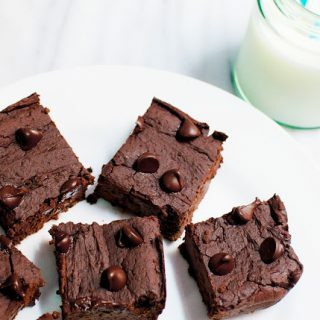 Satisfy your chocolate craving with these easy and healthy flourless double chocolate brownies. They’re naturally gluten free! Ever since I started revealing my excessive baking habit to the world blogging, I am constantly asked by friends and family “who eats all of that?” I guess I should – and do – take it as a compliment, because the implication is “I know you don’t eat everything you bake because if you did you’d be as big as a house and you’re not”. So, thanks. My response is almost always the same: 99% of the decadent stuff I make is for someone else. The simpler, lower-sugar and more wholesome recipes you see here are typically what I eat more of, because let’s face it: buttercream will only get you so far. Which is why, when I discovered Kylie’s blog Imma Eat That (Don’t you just love the name? Straight to the point. ), I was immediately hooked. 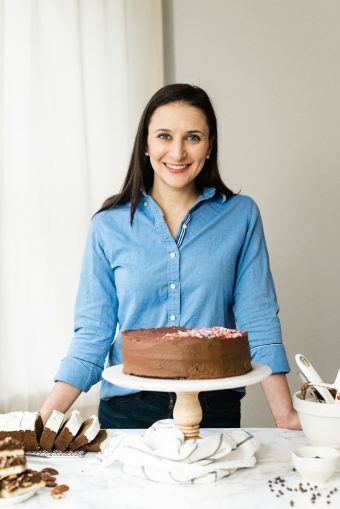 Not only is she a hilarious writer and amazing photographer, but her recipes are always so delicious and satisfying without any of the heavy ingredients that make you feel sluggish and gross for the next several hours. Win! I’m so excited and honored to have been asked to contribute a guest post for her while she is out of town this week. I peppered her with about a hundred emails with recipe suggestions, but finally settled on these flourless brownies, made with black beans, if you can believe it. I chose them partly because they taste great and are healthy, gluten free, and simple – in line with her cooking philosophy – and partly (I admit!) because I desperately wanted to bring her over to the dark (black bean) side, after her confession that the concept of black beans to make flourless brownies kind of freaks her out. I’ll save the sales pitch for later though, since she is on vacation and therefore should be eating a REAL brownie right now. This recipe originally appeared as a guest post on Imma Eat That. 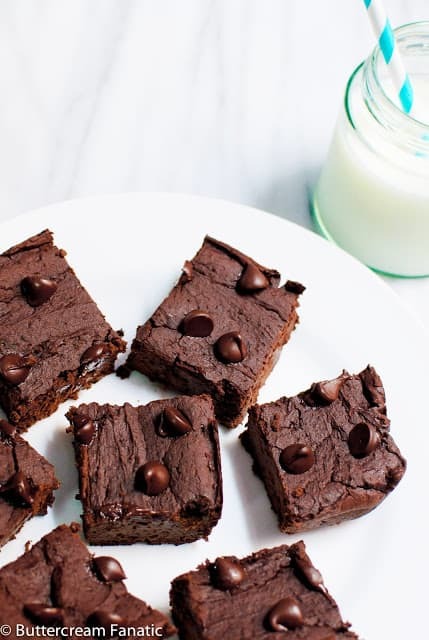 Satisfy your chocolate craving with these easy and healthy flourless double chocolate brownies. They're naturally gluten free! Preheat the oven to 350F. Spray a loaf pan with nonstick spray and set aside. Melt the chocolate chips in the microwave. This will take about 90 seconds to a minute on the high powder setting. They may not melt completely; stir vigorously to finish melting the chips until chocolate has a smooth and uniform consistency. Pour black beans and melted chocolate into a food processor and pulse until smooth. Add the rest of the ingredients and continue to pulse until completely smooth. Scrape down the sides of the bowl and pulse a few more times to make sure everything is completely incorporated. Pour into prepared pan and smooth to level and fill corners, etc. Sprinkle remaining chocolate chips over the top. Bake for 25 minutes until the top has cracked slightly and the center has set. Allow to cool for 20-30 minutes before cutting into 2" squares. These are best if eaten immediately after they are made, but can be stored in an airtight container in the refrigerator for up to 5 days or in the freezer for up to 3 months.